DragonFish sites are fairly common, although this offers an entirely fresh look and some nifty features. Bingo3X is name which you may not be familiar with, particularly as the name is a little out of the ordinary. They say the 3X part stands for three times the fun, so we popped along to review the site to see if this really was the case. A couple of quick things to nots is that it uses the wildly popular DragonFish software, offers a 200% sign up offer and supplies both 75 and 90 ball bingo – based on those points we’d say it sounds pretty good already. The first thing that strikes you is the red, white and blue colour scheme which is a nice change from the now staple pinks seen on other sites. A cute and fun feel is can still be felt because the site has multiple red mascots which pop up to tell you what job they have on the site. 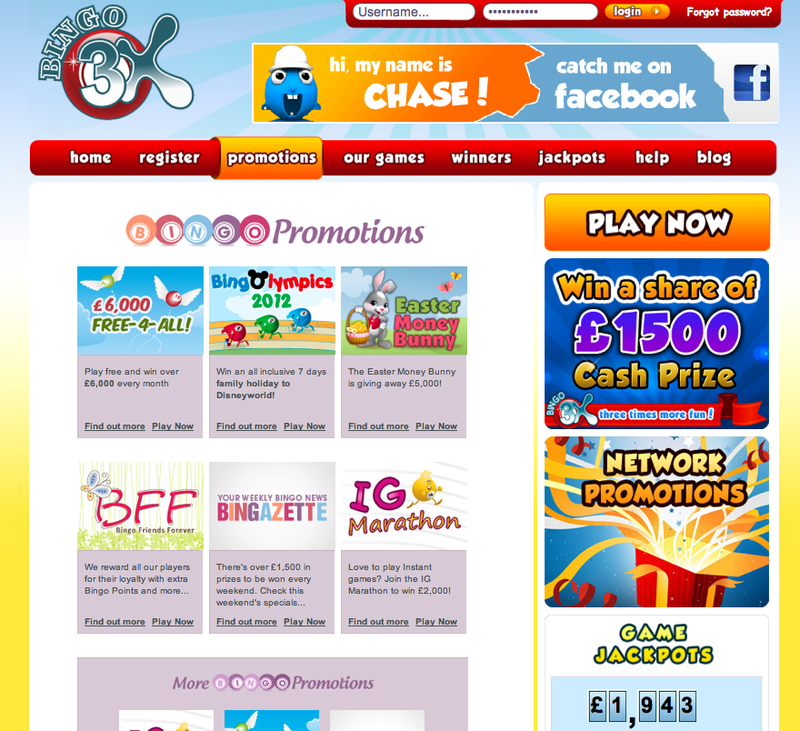 The main guy is bravos, who promises bingo bounties both on the homepage and on the sites Facebook profile page. The homepage is well laid out with various information on promotions, recent winners and upcoming games all readily available. It was also great to see a link to help menus on every page where you can access live chat or the freephone phone number if you ever encounter a problem. 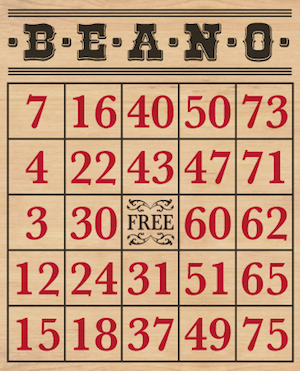 If you’ve played on any other DragonFish site you’ll know that their bingo is top notch. 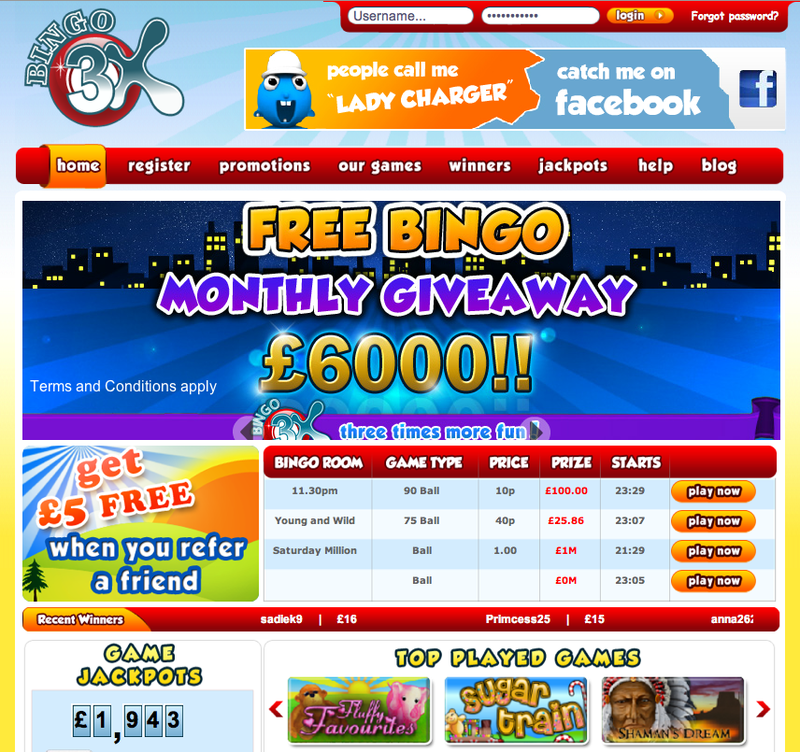 Bingo 3X offers 75 ball and 90 ball bingo with a full schedule running around the clock every day of the week. Fans of slots won’t be disappointed either because heavy hitting games such as Fluffy Favourites and Roland Rat Superstar are included as standard. The great thing about DragonFish is that they are constantly updating their catalogue to include new games, so you can look forward to a new game on a regular basis – many of which cannot be found from other software providers. Players can claim £20 free when they deposit £10 for the first time. There’s also a 50% match on all subsequent deposits, or reloads as they put it. At the moment they are also giving newbies a free £5 Amazon voucher plus £5 for every friend they refer, so bring your buddies and you’ll be quids in. There are plenty of regular and topical promotions available too, 2012 has already seen bespoke ones for Easter and the London Olympic games – so it’s safe to say there’s plenty more to look forward to. There is plenty of positives to focus on here, especially the great range of games. It’s also nice to see a site with such a fresh design after a glut of skins in 2011 were so samey. Let us know what you think by leaving your review below.